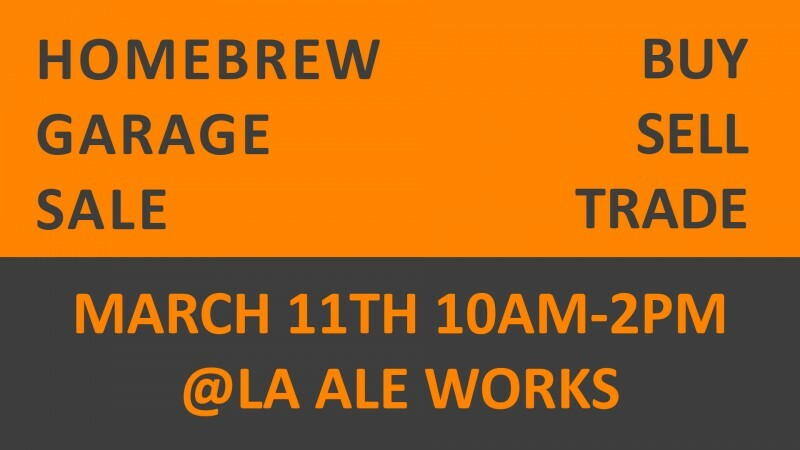 Come join us for our first ever Homebrewers Garage Sale! EVERYONE is invited to attend from beginners looking to pick up bargain equipment, to the experienced brewer looking to shed some extra gear. There will be lots of shiny stuff for all! You do not need to be a member of the club to attend. Buyers: you are welcome to show up anytime between 10 and 2pm. Early bird gets the good stuff. I can tell you there will be a full range of used equipment for sale. Kip will have the tasting room open and beer flowing. Sellers: we recommend that you plan to show up at 10am, and stay until 2pm or all of your equipment has sold. Anyone can attend and setup to sell. I do ask that you RSVP so I have an idea of how many sellers we will have. Please rsvp via email to president@strandbrewersclub.org. Tables are welcome and encouraged (depending on how much equipment you have to sell). I will have a few extra, mention in your rsvp if you would like one to borrow. Grouping equipment by prices, or labeling larger items will help you sell more stuff. All: please RSVP if you plan on attending. A good headcount always helps with planning. If we have enough people we will have a food truck on site. Should be fun for all. Hope you can make it!